Australian supermarket group Coles has reached an exclusive supply deal with one of England’s biggest makers of up-market chips, Tyrrells Crisps (Tyrrells). Coles confirmed to Australian Food News that the exclusive 12-month supply deal — Tyrrells’ first move into the Australian market — could lead to Tyrrells setting up a manufacturing base in Australia, which could be a big boost for Australian potato and vegetable growers. The deal will see Tyrrells sell its products in 700 Coles supermarkets across Australia, which is part of a global push from Tyrrells to generate half its revenues from outside the UK. Tyrrells currently manufactures its chips on farms in Stretford Bridge in Herefordshire UK and exports them, but Australia could become a new manufacturing location for Asian and Pacific regional markets. Australian Food News notes that the Tyrrells international business expansion model — lining up a key supply deal for the brand in higher-level volumes through a supermarket group in Australia with a view to then moving into manufacturing for export of its premium products through a broader region — could be a good example for developing food businesses to follow. Tyrrells was founded by potato grower Will Chase in 2002 and chose to sell his upmarket product through independent stores and Waitrose. Tyrrells developed its own style of upmarket potato crisps, as well as other vegetable crisps, including beetroot, parsnip, sweet potato, carrot, apple and “swanky veg” crisps. It markets the products as ‘high end’, making much of fact that the crisps are hand cooked in small batches, and that the skins of the vegetables are left on because “that’s where all the flavour and goodness is”. In 2006, Mr Chase was involved in a highly-publicised dispute with UK supermarket group Tesco. Mr Chase said Tesco had been stocking his products – which retailed at around 90p – despite his refusal to supply to the chain. Due to the growing success of the brand, Mr Chase said Tesco approached him several times with a view to stocking his crisps but when he refused it sourced them through the grey market and was selling them at reduced prices at 60 stores. Tesco eventually agreed to stop stocking Tyrrells products. 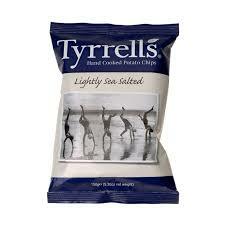 In 2008, UK-based private equity firm Langholm acquired Tyrrells from Mr Chase for £30 million. Five years later, in August 2013, Langholm sold the crisps company to Dubai-based firm Investcorp for a price reportedly more than three times its acquisition cost. The Tyrrells business has grown over the past few years under the leadership of its current Chief Executive David Milner, who is a brand and marketing specialist and who had previously worked at Proctor & Gamble, Mars and Kettle Foods. Mr Milner worked in Australia for Kettle Foods, which means he already has an understanding of the Australian potato crisps or chips category. Milner has mentioned in various interviews that a feature of his marketing strategy has been the packvertising in lieu of costly TV advertising. By this he is referring to the Company’s usage of clever imagery in black-and-white on the products’ own packaging. Many of Coles senior executives today are from the UK having been recruited by Wesfarmers or are UK expatriates head-hunted by otherUK expats in the Coles management team. The Coles executive team are well aware of Tyrrells, not least from the highly favourable publicity that Tyrrells generated out of its early ‘dispute’ with Tesco. The consumer shift and perceptions of ‘healthier’ t foods being made as ‘whole’ products (such as cooking a vegetable in its skin) has also strengthened the brand. Any future move towards local production in Australian makes it more likely the brand will be esconced successfully in the minds of Australian consumers. Securing a major supply deal with an Australian supermarket should generate the base revenue needed by the supplier for additional manufacturing capacity in Australia to service a broader market in the Asia-Pacific region. The Australian vegetable processing industry has faced difficulties in the last few years, with many vegetable processors closing manufacturing facilities or reducing capacity because of high manufacturing costs. Australian Food News reported in October 2013 the closure of food manufacturing company McCain Foods of its potato processing plant in Penola, South Australia. In June 2013, Australian Food News reported that food manufacturer Simplot has also announced that its vegetable processing plants were at risk of closure because of the “unsustainably high costs associated with manufacturing in Australia”. According to figures from Australian vegetable and potato growers’ representative group AusVeg, processed potato imports have increased in value from $17.4 million in 2007-2008 to $31.4 million 2012-13, while Horticulture Australia Limited reported that the volume of processed potato production in Australia dropped considerably in 2011-12. The volume of fresh potatoes grown in Australia had also decreased since 2007-08, according to figures from AusVeg.